Identification: Upperside of male is dark brown with dark orange patches on lower outer edges of wings; female is tawny with dark margins. Underside is dark purple-brown with an iridescent green sheen. Postmedian line is very irregular; dark toward the base of wing, white toward the outer margin. 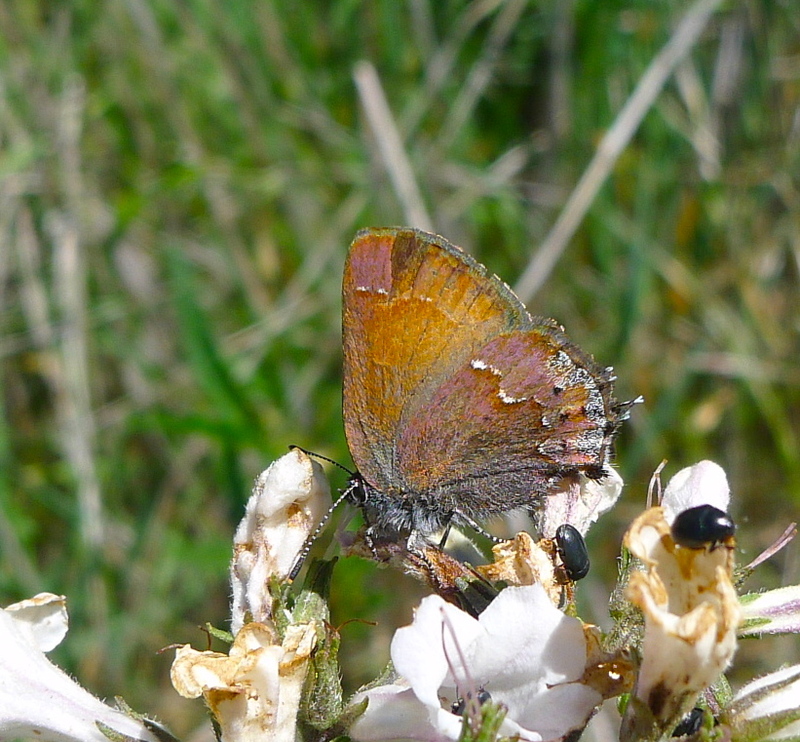 Blue-gray patch near hindwing margin contains 3-4 reddish spots; 3-4 small black spots are near this patch. Caterpillar Hosts: Cypress, especially Sargent cypress (Cupressus sargentii) and MacNab's cypress (Cupressus macnabiana). Adult Food: Nectar from flowers of wild lilac (Ceanothus) and other plants. Range: California\'s Coast Ranges from San Luis Obispo County north to Mendocino County; Guadeloupe Island, Mexico. Conservation: This butterfly is of moderate concern. The Nature Conservancy Rank: T3 - Very rare or local throughout its range or found locally in a restricted range (21 to 100 occurrences). (Threatened throughout its range). Management Needs: Conserve as many habitats as possible. Inventory and monitor populations.